Thought I'd share my winter well-being tip with you. In order to stay on top of my winter exercise routine, I take Viral Gaurd every morning with a glass on orange juice after breakfast. Viral gaurd has Probiotics in it which is a good flu fighter. 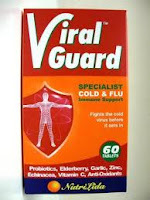 Most people only take Viral Gaurd when they start getting sick. I on the other hand take it throughout the year. I'm not saying that you won't get sick if you take Viral Gaurd, but you most certainly won't get the flu as bad as any other person who is not taking it. I wonder if I can find it here. I'll check because I almost always get sick during winter...and usually twice! If you guys don't have Viral Gaurd, you can get something very similar which would be a Vitamin C tablet BUT make sure it has Probiotics as 1 of the ingredients :-) Hope this helps you.